Go through HAS to get to TEX-North. See Extended Introduction for more on getting there. Relationship karma can affect how well or unwell relationships go in your life, especially with family, friends, coworkers, and enemies. TEX-North, the Karma Cube, will reveal the relationship karma that you carry and help you to neutralize it, so that your relationships can be karma free. Karma can take on a positive form or a negative form. It is the negative karma that often brings pain and discomfort to your life. However, karma can be positive too, especially in relationships. For example, quite often children and parents are bound by karmic ties. In this case, the karma can take on a more enjoyable nature, with discomfort mixed in. Romantic relationships are often the product of karma binding two people together. Not every relationship carries a karma bond, but it is important to know where karma is operating in your life. It is always desirable to be be bound by love over karma, but of course you can love the things that you are bound to by karma. As far as the ascension process goes, you want to have the least amount of karmic ties (positive and negative) as possible. An excess in karmic ties can cause your energy to become limited to the earth. The Aethyrs are very much aware of karma and how it can hold you to the earth plane, many of your adventures in the Aethyrs will involve the shattering or the burning away of karma. The "Karma Cube" is the beginning of understanding the relationships in your life that are karmic in nature, and it offers a way to neutralize that karma. You can, of course, see the need for neutralizing karmic relationships involving enemies. Buy why would you want to neutralize karma, even karma that seems pleasant? Two reasons! All karmic energy is a tie to the earth plane. Karma is likened to a magnet. It will pull together bodies with strong karmic ties. If you have too much relationship karma, you will be pulled back into physical existence, just for the sake of neutralizing this energy between you and them, regardless of your spiritual knowledge and rank. The second reason is that relationships that are karma free are far more enjoyable than those with karmic knots. Relationships with karmic knots are wrought with vacillations of pain, disappointment, hurt, and joy. By neutralizing relationship karma this vacillation between joy and pain will be gone. You will be free to create a relationship built on love and its attractive force. There is little friction between relationships when they are built purely on love. 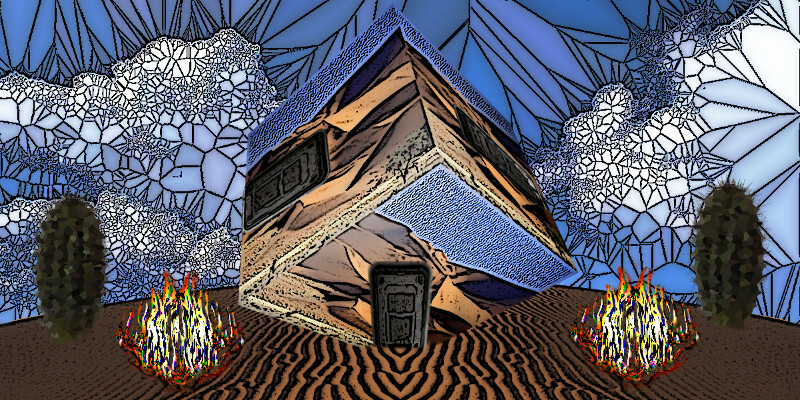 Before you enter the door to the Karma Cube stop by the burning bush (who is a spirit guide) and talk to it, if you choose. The spirit guide is a fire elemental. Fire elementals embody the energy of change and transformation. Adventures in the Karma Cube will help you to identify the karmic elements in your life and even help you to rid yourself of the unpleasant ones using the energy of fire. Karma can be shattered or consumed. When you shatter karma you hit it hard with a singular, powerful event or energy. When it is consumed, then over time the karma is burnt away through the natural interaction of daily activity. Negative karma is the kind that is most desirable to rid yourself of, because it causes pain and suffering. The Karma Cube can help you release relationship karma, achieving this neutralization outside time and space. Nonphysical energy work like this is often quicker and less stressful than working it out over years, with only the physical plane as the only arena to work it out. Inside the Karma Cube you will embark upon adventures that will identify karmic relationships in your life. Continued visits to the Karma Cube will help you to shatter or consume this karma. Visit here when you want to learn what relationships in your life carry karma. RII-North can reveal karma that is not related to relationships, like your past actions & thoughts, and offer a way to neutralize them. If the karma is great it could take several to many adventures in the Karma Cube to break it up. Gift, Wings: Given to you if you have neutralized all your karma (relationship and sitation). This gift is also avaiable in RII-North. Hermes unofficial rock and roll song for this location: Come Together, by Aerosmith.